As we stand together this week in solidarity with women of all backgrounds, it is crucial to remember that women, on average, face a pay penalty compared to men. A typical, or median, woman working is paid 83 cents for every dollar a typical man is paid. However, the gender wage gap differs for women of different levels of education and for women of color. When we compare the wages of white women and women of color with wages of white men, white and Asian women fare better than their black and Hispanic counterparts. Compared to non-Hispanic white men, white non-Hispanic women are paid 81 cents on the dollar and Asian women are paid 88 cents on the dollar. 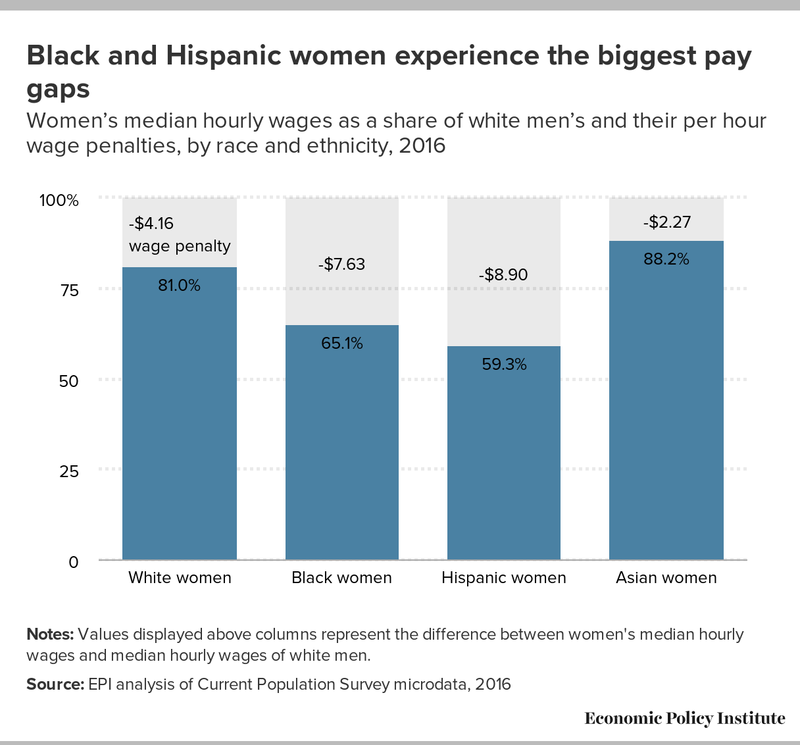 But the penalty is much larger for black and Hispanic women, who are paid only 65 cents and 59 cents on the white male dollar, respectively. In terms of the impact on women’s paychecks, this means that relative to the typical white man, black women take home $7.63 less per hour and Hispanic women take home $8.90 less per hour. Notes: Values displayed above columns represent the difference between women's median hourly wages and median hourly wages of white men.